This product will add 0.95€ to your cashback account. The Pringles Act:Taught as both a bar or restaurant set. Hannibal will be including a chop cup routine not seen on his DVD! Lethal Weapon:A mentalism routine filled with comedy that plays for both stage performers as well as the parlor performer. This is FILLED with comedy. Cards Across:Hannibal shares with you his version of the classic card effect. This can play for the close up crowd all the way to the stage. A very versatile card routine! Ask Anything:An exercise that Hannibal does on his social media. This is a Q&A session "unleashed." Also Covered:Asking the right questions. Choosing the wrong trick. Hannibal also shares with you a short essay on failure. Magic vs Magical:Hannibal talks about what he feels the differences are, and shares his thoughts on how you can take something "magical", and make it "magic". 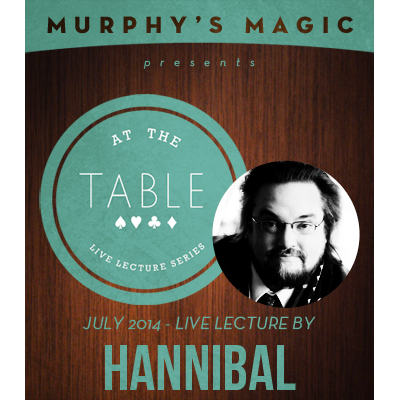 PLUS:Hannibal will share with you his philosophy on knowing your limits and how to push them. He will also talk about knowing your "character". Hannibal further explains why he doesn't have tons of material. Hannibal will talk on the concept and execution of "Sleight Club". He will also share with you the Mrs. Doubt fire story.